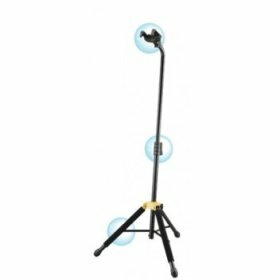 High quality single guitar stand with Auto Grab System. Will accommodate electric, acoustic and bass guitars. Hercules guitar stands feature the patented "Auto Grab System", an automatic retention system that safely and securely accepts any guitar head stock shape. Simply place your guitar on the holder and the weight of the guitar activates two small arms which rotate & lock your guitar securely into place. Soft & shock absorbent SFF rubbers protect your guitar at all points of contact. The height adjusts to fit almost any size electric, acoustic or bass guitar.